Last year our household tried a new idea during Holy Week. Inspired by the an online resource, we embarked on the Easter Story Lego Challenge. 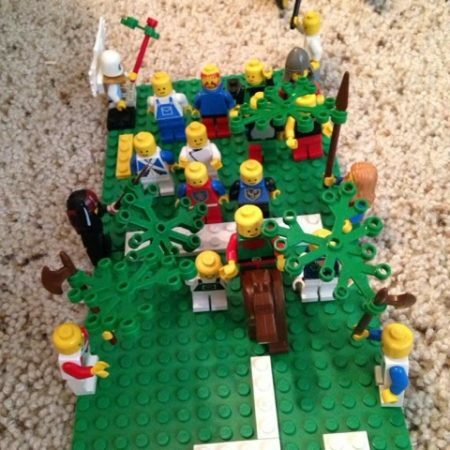 The process is simple: for each day of Holy Week, we read a Scripture passage, and then built a Lego creation to portray the gospel story. 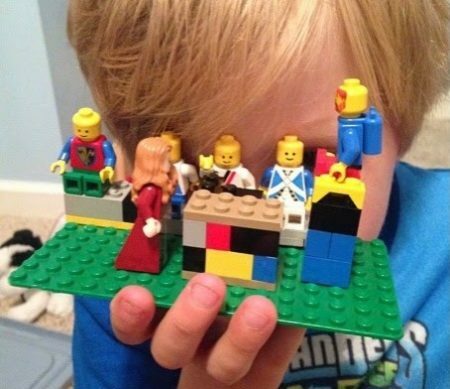 I myself did not create the Lego journey; the idea Easter Story Lego Challenge comes from Proverbial Homemaker. You can buy a guide kit for a few dollars, which includes the Bible readings, activity/craft ideas, Lego challenges, and optional extended challenges for after Easter. I printed it out, made some changes, and helped my son Hill journey through Holy Week with Lego. At our house, we actually started the Saturday before Palm Sunday. This was so that my son Hill could be refreshed on Jesus’ triumphant entry into Jerusalem before going to church on Palm Sunday. The other change I made was adding a footwashing and last supper challenge. Again, the process was straightforward: after reading the assigned story from either a children’s Bible or NRSV Bible, Hill created the scene with his Legos. Once finished, he would retell me the story using his own words. Day One was Jesus’ triumphant entry into Jerusalem. Hill’s attention to detail is phenomenal. Folks line the street waving palm branches, while Jesus rides atop a donkey. Hill insisted on twelve disciples accompanying Jesus, even though I told him just a few were fine. For him, everything needed to be as close to the biblical account as possible. Day Two was a story Hill had never heard before because it’s not found in any of our ten children’s Bibles – Jesus turning over the tables in the Temple. Day Three was the story in which Jesus teaches the disciples about the greatest commandments. Hill created this as a two-part story: one scene with the disciples arguing, and another scene with Jesus teaching them. On Day Four we read the story of Jesus’ anointing. Hill recounted the story in his own words, “Mary came to Jesus from behind with a giant jar of perfume so she could anoint his feet, while the disciples sat there and got angry because they wanted to sell the perfume to get money for the poor.” I loved seeing how he changed the Jesus Lego figure each day. It struck a chord with me to see Jesus as Captain Jack Sparrow, or Jesus as Robin Hood, or this case Jesus as a Scuba diver. It was a special reminder that we can see Jesus through any number of people in our lives. On Day Six the story way Jesus washing the feet of the disciples. You can see the picture of Hill’s scene below, as well as a video of Hill describing his footwashing creation while retelling the entire biblical event. It is amazing to hear how well he internalized the story. On Day Seven Hill created a simple cross after hearing the story of Jesus’ death. Then, on Easter we read every version of the resurrection we could find. Building the empty tomb out of Lego was a bit too challenging, but maybe next year! 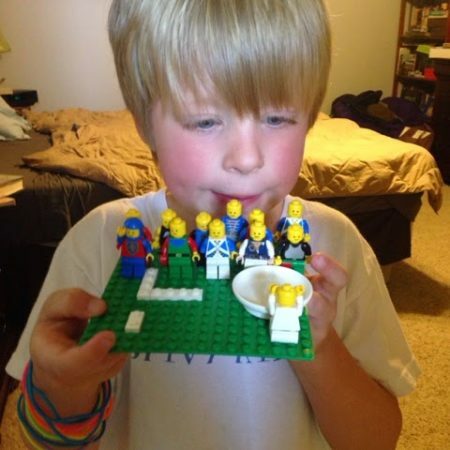 Again, the Lego challenge was not my own creation – we were simply happy to try it in our home. 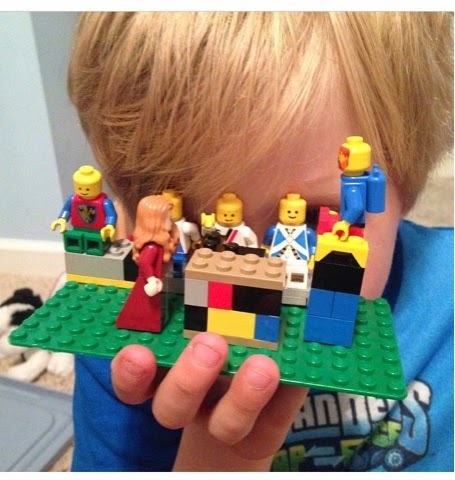 If you are interested in the idea, check out Easter Story Lego Challenge from Proverbial Homemaker. Enjoy! Allison Sandlin Liles is wife, mother, priest and peacemaker living in the Blue Ridge Mountains of Virginia with her two children, husband and River dog. After working in parish ministry for six years, she now works part-time as Episcopal Peace Fellowship’s Executive Director focusing on gun violence prevention, death penalty abolition and empowering young adult peacemakers.